It’s only the second day of summer, and the season is definitely making its presence known. How do you plan on beating the heat? Here are some helpful tips on keeping your horse cool and comfortable. The average horse at rest will drink 5 to 10 gallons of water per day. This amount only increases with size, workload, and environment (hello, humidity!). Here are a few tips to encourage your horse to drink. Adding electrolytes to feed (not water). Anhidrosis is a condition horses can develop where they don’t sweat appropriately. This doesn’t always mean that they don’t sweat at all. Some sweat a bit, just not enough. Signs to look for other than not sweating can include an increased respiratory rate and fatigue. There are several supplements out there with variable results. Acupuncture is an effective treatment for many horses. For those known to be affected, it is important to start treatments early for best success. Misters used with fan can help these horses cool themselves while indoors. Obviously rinsing your horse off is an effective way to remove sweat and cool them down. Be sure to use a sweat scraper to remove all excess water. Extra water left on the skin can actually insulate. This causes your horse to become even more hot quickly. 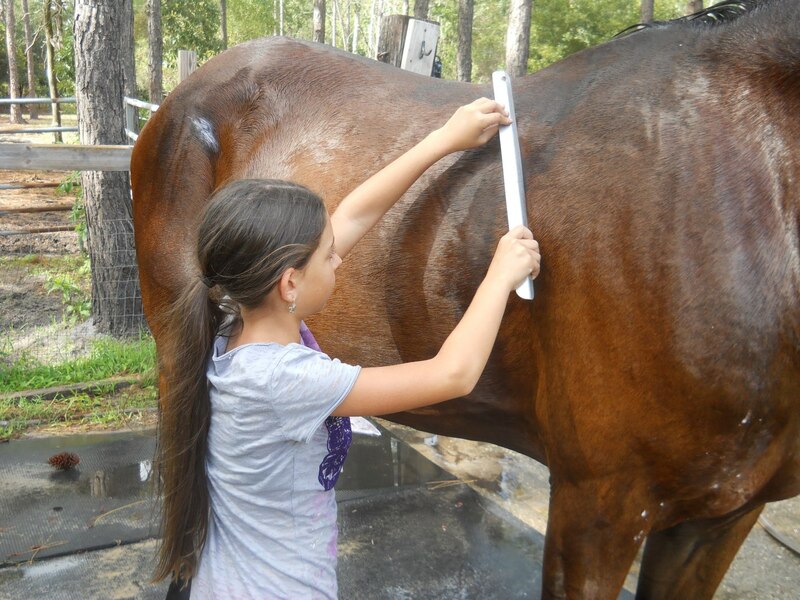 If your horse is very hot, be sure to rinse, scrape, and repeat multiple times. After scraping, placing them in front of a fan can allow the remaining moisture to evaporate. Do you have any other tips for keeping your horse cool? Be sure to let us know!